Foot washing was a common practice in Bible times. People wore sandals and walked along hot, dusty, and sometimes muddy roads and paths. Generally, a host assigned the menial task of washing the feet of guests to the lowest servant in the house. Failure to wash a guest’s feet was considered a breach of hospitality (see Luke 7:44). When Jesus and His disciples met for the Passover meal, no servant was available to do this humble service — and none of the disciples volunteered to do it. So Jesus did it Himself. Jesus quietly got up, removed His outer clothing, wrapped a towel around His waist, and took on the role of the lowest servant. Imagine the hush that filled the room as Jesus knelt to wash the filthy feet of the first disciple. Perhaps the others looked at one another in wide-eyed amazement. Peter thought this task was beneath Jesus but didn’t offer to take His place. In fact, none of the disciples offered to take His place. Ironically, prior to the supper the disciples had been arguing about who would be the greatest in the new kingdom they expected Jesus to establish (Luke 22:24). Jesus’ humble service definitely stood in contrast to their ambition and desire for places of prestige. 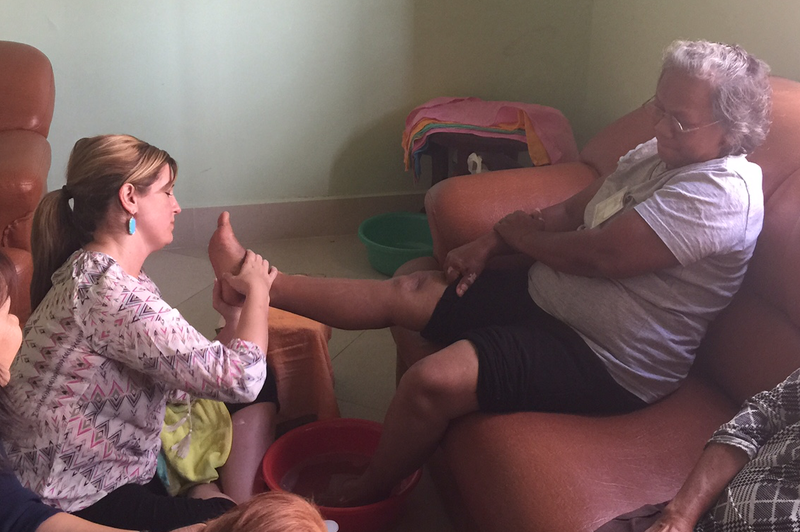 As a final act of service to the women who attended our first women’s conference at The Hope Center, our ladies followed the example of Jesus by washing the feet of those who attended. I don’t think any of us expected what happened next. Our new Cambodian friends began to weep, repeating that no one had ever treated them so kindly. And then, our women began to weep. At one point, one of our ladies came to me in tears. She said that her new role was to wipe away the tears of our women as they sat and washed feet. This simple act of service did more than wash away the dirt caked on the feet of women who daily walk along dirt paths, many in their bare feet. Washing their feet validated what we have taught all week — that these women are created in God’s image and worthy of being treated with dignity and respect. Teaching with words alone isn’t always enough. Sometimes you have to go beyond words in order to effectively write your message on another’s heart. Washing feet proved to be the quickest path to hearts aching for affirmation. Jesus was right. By touching and washing feet we were able to touch the hearts of our Cambodian friends — and, in turn, they touched our own hearts. Very touching story. I teared up just reading it. Thanks, Beth. It was a sweet experience.